After I heard that it was even used Moscatel casks they got from Caol Ila I think even more that the price is a no-go. They talked quite frankly about it, it's sort of a trash reduction if you will, the task was to find a way to re-use the old casks the Classic Malt Distilleries used for making their Distillers' Editions. As I said before, I like the idea of that experiment, but please don't fool us, it is not an extraordinary super sophisticated special vatting, it's just basic 16-year-old having been put in casks which would otherwise have been trashed. As for my rating, I'd love to put a review here, using the weighted rate function, unfortunately being mobile this doesn't work. So it's low 80s for the nose, a little above 90 for the initial taste, again low 80s for Body and Finish. 85 for the presentation and 50 for the price. In my mind that adds up to a 78. Just thought about it, I can be quite frank, too. You take the stuff which has a street price of about 40,-€ to 50,-€, put it in the rubbish of a neighboring distillery and sell it to the enthusiasts at the festival for almost four times the price! In itself, the notes in the nose are not bad in itself, but here the acid is completely out of balance. The mouth speaks a completely different language, the Blockmalznote reminds me even strongly of the Laphroaig 21y FoL which is clearly a compliment, but this transition to sugar tears it back. Finally, the finish cries for a cup of coffee to rinse off the sugar. Apart from the fact that the result is quite doubtful from my point of view, I find the experiment itself interesting, but the associated price policy as a joke. These are the same barrels that normally go into the Distiller's Edition, and the barrels that came with them were once taken from another Classic Malt called Caol Ila. If I found the result of the experiment to be good, then I would also find a price in the range of a DE with a cask strength surcharge, ie around £ 70 to £ 90, £ 125, but can not do it any more. A bit snappy at the beginning, but that settles quickly. Then there are grated apples and carrots, a few mineral notes and some phenolic smoke, quite a lot of acid that does not look fruity, rather disinfectant. Longevity does not change much, in the background a dark, malty caramel touch tries to penetrate forward, which does not succeed. When heated, it even flattens noticeably. Rubber, wet lime, the alcohol bites something again. In the mouth, he starts thin, without any note profiled, somehow slightly sweet stop, and the next thing that comes, is a poorly bound alcohol that brings a dark sweetness, which initially reminds of blockade, but then drifts more and more into sugary , There is nothing left of the acidity of the nose here. The finish becomes increasingly sugier and warms the chest. Of course, he is also long, but I do not know if he would prefer me shorter. Here, too, the ash tries to prevail against the sugar water until the end, the whole thing is sloppy. [May, 2017] I had several drams during the Feis Ile, e.g. at Georgie's Masterclass or Pinky's Warehouse tasting. The colour is pale straw and the texture shows fast thick legs and slow tears. The nose is very fresh on citric fruits (lemons, lime - that vanish after a while) and a bold phenolic smokiness. After that a nice heather honey sweetness takes place joined by malty aromas. 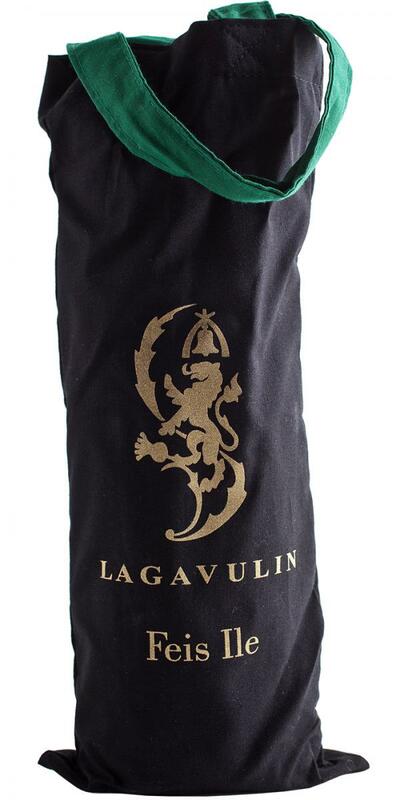 The mouthfeel is warming and instantly coating with a slight drying feeling of cold ashes and copper. The taste is quite sweet, malty and phenolic. Again some drying notes but this time rather from tannins. The finish is very long and nicely sweet without compromising the balance of sweetness, maltiness and phenolic smoke. Some drops of water release a much better nose but the drying resp. bitter notes of the taste increase too. So nose it with water, but drink it neat (You find this hard to do? I agree, but simply use two glasses...). I tried to comprehend the tasting note of rottendon below but failed - obviously there is no accounting for taste... 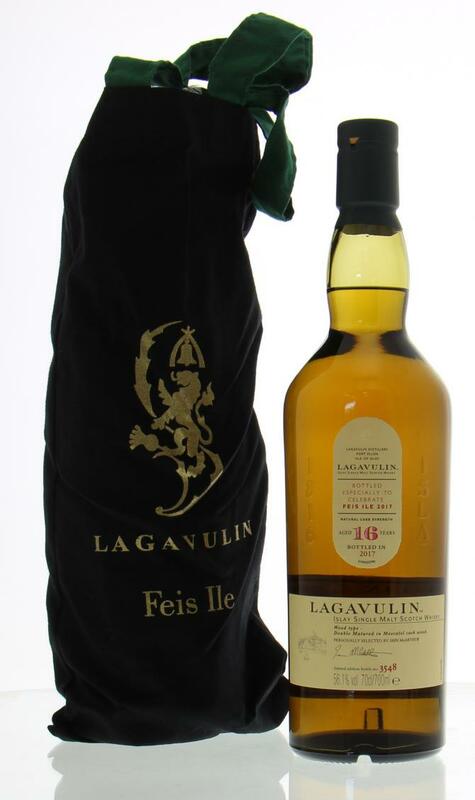 This Lagavulin is certainly not the strongest of all the Feis Ile editions so far but nevertheless a very fine dram. A good smoky-peat whisky, very finely tailored, there are no special complaints about it, but also enthusiasm, too, too typical Islay, without any distinguishing features. 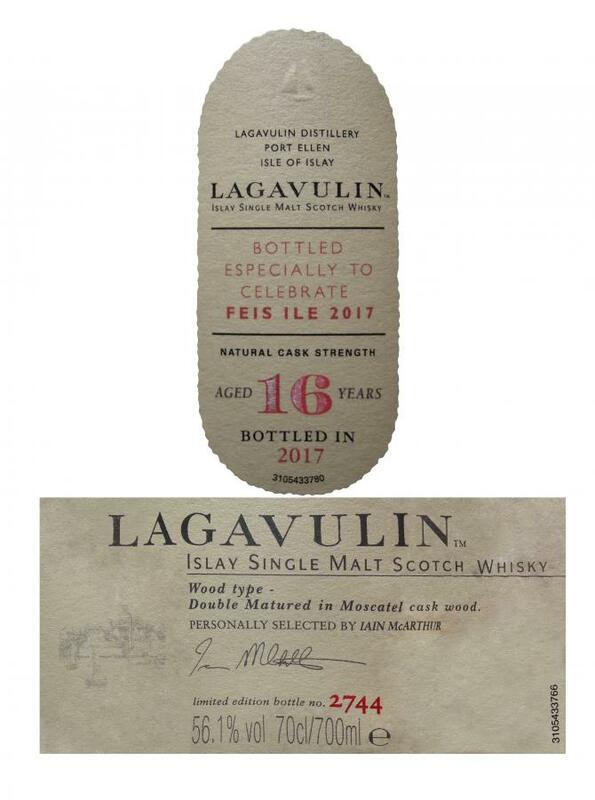 Open, dry, soft peat and smoke, wool, "animal" notes, smoked meat, lemon peel, light resinous shades, carpentry workshop, cut boards. Spicy, warming, smoky ash notes, oak, lemon peel, peat, herbal bitterness, dry medicinal herbs. The sweet moscatel overpowers the whisky. In the end it's just a sweet Laga. Which is still a good whisky. I didn't pay for a bottle though, in which case, I too, would be disappointed. Notes from a sample I got from Franz. 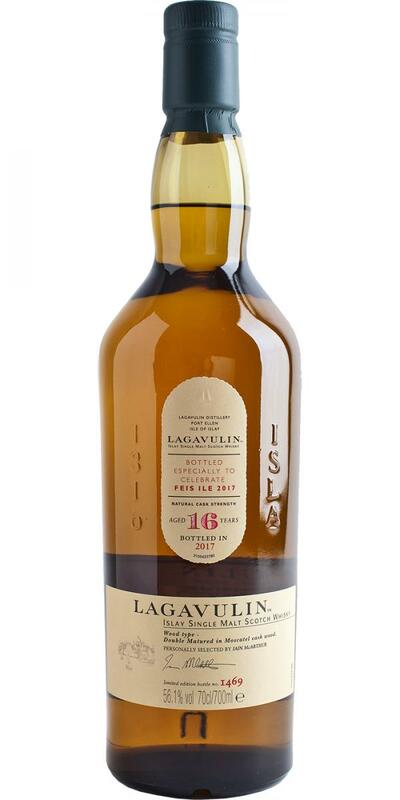 When I heard about this whisky for the first time, I had the faint hope that its quality would go a bit towards the old Lagavulin 16 from its early days ... now this one is miles away and regardless of that, I find it right simple and not very complex. Good quality, nothing more! 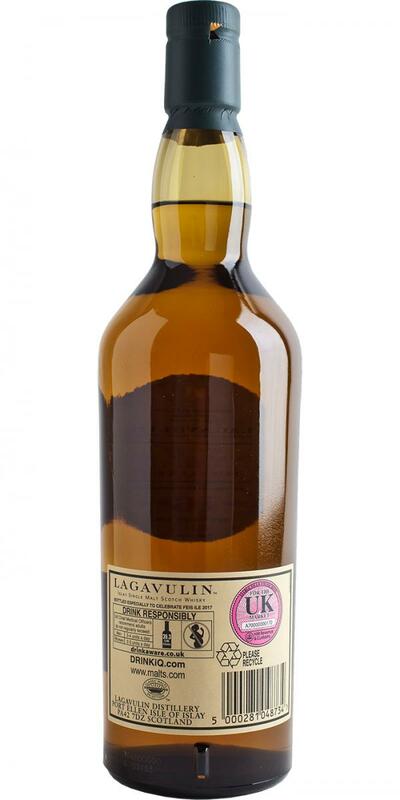 I wouldn't go as far as to think it's a horrible whisky made by detestable canards, but I do think finishing what tastes like a contemporary Lagavulin 12yo in moscatel casks brings absolutely nothing new or interesting to the table. A forgettable, unnecessary experiment. What you get is a nose very, very similar to Laga 12, with a damping layer of nondescript sweetness on top.